Christopher Skinner, What are they saying about the Gospel of Thomas? My copy of Christopher Skinner, What are they Saying about the Gospel of Thomas? arrived just the other day and I'd like to recommend it as a great way of catching up on the latest in Gospel of Thomas research. Since its discovery the Gospel of Thomas has been the subject of intense study for those with interests in the developments of earliest Christianity. Three questions remain unanswered in contemporary scholarship: (1) When was Thomas composed? ; (2) What is the relationship between Thomas and the canonical Gospels? ; (3) What theological outlook is presented in the Gospel of Thomas? This volume provides a comprehensive overview of recent scholarly opinions on these three questions. "A very valuable book for both students and scholars mired in the ever-growing swamp of Thomas scholarship. After the text itself, this is an excellent place to identify the nodal issues in the study of the Gospel of Thomas." "The Gospel of Thomas is the noncanonical gospel that everyone wants to know about. More is written on Thomas than on any other early Christian gospel outside of the New Testament. But the scholars do not agree about the character of this enigmatic work, its relationship to the New Testament, its date, its 'gnostic' character or the role it should play in Historical Jesus research. But now Christopher Skinner has provided a clear, coherent and compelling account of the diverse perspectives on this text, explaining how the scholars approach its enigmas, offering students an ideal starting point to what they are saying about the Gospel of Thomas." Gathercole and Goodacre, eh? Those names have a ring to them. This book is going to be really helpful in my undergraduate course on Non-canonical Gospels. On amazon, the book is a snip at only $6.40. I am grateful to Larry Hurtado, Gospel of Thomas and the Synoptic Gospels for his summary and endorsement of my forthcoming book on the relationship of the Gospel of Thomas to the Synoptics. I think he summarizes its argument very well and I am delighted that he found it persuasive. Seeing that post reminds me that I have not actually blogged on the book here yet. I am looking at the proofs at the moment and it should be out in the summer. I am also reminded that I have not mentioned another recent publication on Thomas and I'll make that the subject of my next post. I have recently been focusing on criteria in the Historical Jesus quest in my regular podcast, the NT Pod. I'm in the middle of a course on the Historical Jesus at Duke at the moment, so the topic has been very much on my mind. 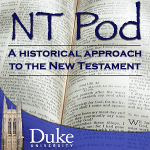 So far, I have three episodes on this theme, NT Pod 59: Historical Jesus Criteria, NT Pod 60: The Criterion of Embarrassment and NT Pod 61: The Criterion of Multiple Attestation. There should be more to come in this series soon. But of course predicted the end ("final nails") is always, in studies of early Judaism and Christian origins, somewhat precarious. In a case that has roiled scholars around the world in a broad range of disciplines, the Jerusalem District Court on Wednesday acquitted an Israeli antiquities collector, Oded Golan, of forging dozens of priceless archaeological artifacts, including an inscription on the burial box, or ossuary, of James, brother of Jesus. This article appears in the Chronicle of Higher Education and it is written by the man who has followed the trial from the beginning and who probably knows more about it than anyone else. Comments: Jim West's blog, which, as so often, had the scoop, James Tabor on Taborblog, Robert Cargill's XKV8R, Jim Davila's Paleojudaica, my colleague Eric Meyers on the ASOR blog, the Response of the IAA on the ASOR blog, Christopher Rollston in Rollston Epigraphy, James McGrath on Exploring our Matrix, Tom Verenna, Todd Bolen on Bible Places, Antonio Lombatti in Observatório Bíblico, John Bergsma on The Sacred Page, John Byron in The Biblical World and no doubt several more. One of the favourite things which New Testament scholars and, probably, Christians in general say about Jesus is that he was ‘unique’. If we think historically, we know two things about the topic from the outset: no two people are alike; there is nothing new under the sun. Like all clichés, these two are true, and the hard thing is to know how to apply them. In this respect these two statements are like general moral maxims and folk wisdom: one or the other will meet every situation, but you do not know in advance which formula to apply when. I live by two maxims: nothing ventured nothing gained, and better safe than sorry. My trouble has been venturing when I should have played safe and the reverse. But one of these two maxims is always true. So it is with regard to similarity and dissimilarity among human beings. Either 'nothing new’ will apply, or ‘no two people are alike’. They might even both apply at the same time, as clichés often do. My wife once said to me, on the same topic, ‘that’s just like a man’, and ‘only you could do something like that’. One of the most interesting things about saying that this or that is unique is that the claim implies what one might at first think to be uniqueness on the part of the claimant: that he or she is omniscient. Omniscience, it will turn out, is by no means unique to any individual New Testament scholar: most have it, or claim to have it. We should all, however, grant that our knowledge is limited. We have very few personal prayers from other Jews of the first century, and so are not able to prove a negative, that no ‘Jew’ (that is, no Jew other than Jesus) could have said abba. We possess no stories at all about how Theudas and others called their followers, and so we cannot say that only Jesus called people with an authority ‘grounded in God himself’. And so it goes on. Great stuff. I am grateful to Dr Cargill for giving me a chance to see the post in advance of its posting. He is an expert on issues of digital technology and how it is used to represent archaeological work and he presents the evidence here with his characteristic clarity, patience and force. While I was looking at the Kloner's 1981 photograph of the ossuaries that are now the focus of Jacobovici's and Tabor's book, website and documentary, Talpiot Tomb B, I noticed something puzzling as I compared those photographs with the new photographs taken with the robotic arm and the snake camera. I do not have a thesis in this post but I do have some questions. They are the kinds of questions that may be cleared up when we have access to more photographs and live footage. However, on the basis of the photographs, map, sketches and labelling we have at this point, some things are not making sense to me. It will be easiest if I draw attention to the anomalies in series of steps. Then if I am making mistakes or reading things wrongly, it should be straightforward for one of those involved to draw attention to where my missteps are. (1) First, take a look at the Complete Findings from the Patio Tomb, Photo 1 in the Press Kit Photos section of the Jesus Discovery Website (cf. James Tabor's Preliminary Report, p, 38, fig. 16). This helpful map of the tomb shows ossuary 5 (the "Resurrection Inscription" ossuary) in front of ossuary 6 (the "Jonah" ossuary) in kokh 3. The same page features two pictures of kokh 3, with ossuary 5 in front of ossuary 6. One thing is clear from those two pictures -- ossuary 5 has a flat lid and ossuary 6 has a domed lid. These two ossuaries are also depicted like this in the museum replicas, ossuary 5 with a flat lid (Preliminary Report, p. 40, fig. 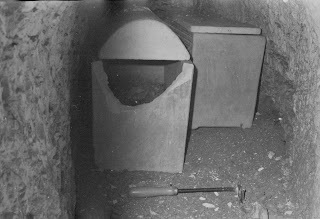 19) and ossuary 6 with a domed lid (p. 42, fig. 21). (2) Next, go to the Preliminary Report, page 32, figure 7. This picture is supposed to represent "inside ossuary 5, kokh 3". Tabor explains "We were able to see inside one of the ossuaries that had a piece of its end broken off (presently in kokh 3, ossuary 5)". He notes that the chalk mark "5" is seen inside and that this mark was made in 1981. Tabor and Jacobovici, The Jesus Discovery likewise describes this as ossuary 5. * What I don't understand is how this can be ossuary 5. In this picture, ossuary 5 has a domed lid and not the flat lid that we saw above in (1). Moreover, there are no signs of the "end broken off" in the pictures of ossuary 5. These do not appear to be the same ossuary. (3) Now go to the 1981 Photo of Ossuary 4 (right) with faint inscription in Greek on the Jesus Discovery Website. This is kokh 2, arranged as it was in 1981, with ossuary 5 on the left and ossuary 4 on the right. At this point, it is necessary to point out that the numbering and positioning of the ossuaries changed between Kloner's hasty 1981 survey and the recent survey, and the differences can be seen straightforwardly by comparing Kloner's 1981 map (Preliminary Report, p. 30, fig. 3) with Tabor's 2012 map (Preliminary Report, p. 38, fig. 16). Luckily, in this case, ossuaries 4 and 5 have the same numbering in 1981 and 2012. With that important point to one side, take a careful look at ossuary 5 on the left in this picture. Notice that again it has a domed lid and it is broken. It looks nothing like ossuary 5 with the flat lid we saw above in (1). (4) Now return again to the Complete Findings on the Jesus Discovery Website. Look at the picture of Ossuary 4 at the bottom. It is described here as "Plain (Not fully explored)", (though contrast Tabor, Preliminary Report, p. 14, "ornamented"). It is not easy to see, but it clearly has a domed lid and it looks like it has a piece that has been repaired in a kind of wide "U" shape. This is curious because the 1981 Photo of Ossuary 4 depicts a ossuary with a flat top, not a domed top, and an elaborate decoration that you can just see on its facade. It is clearly not "plain". 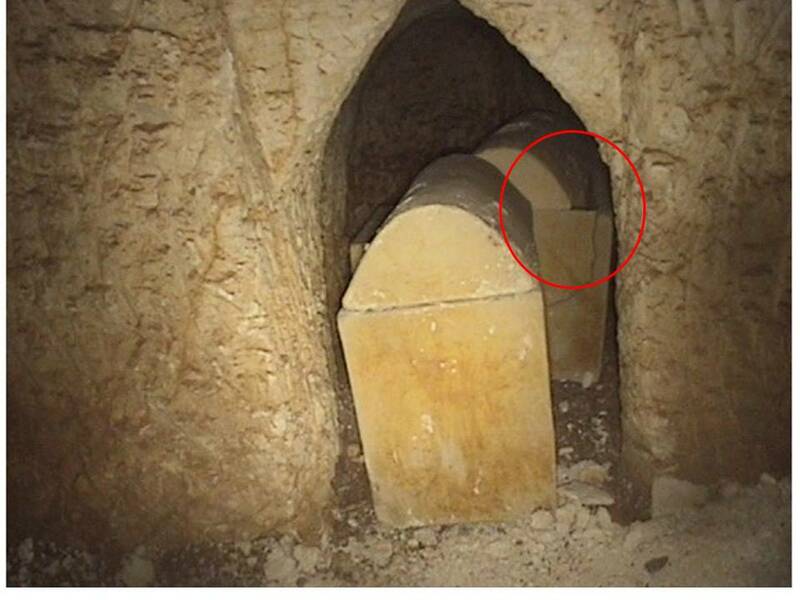 What we can see of ossuary 4 in the 2011 photograph does not look anything like ossuary 4 from 1981. In fact, if anything, it looks like the picture of ossuary 5 from 1981, to the left of ossuary 4. That has the domed top and the broken, wide U shaped hole. 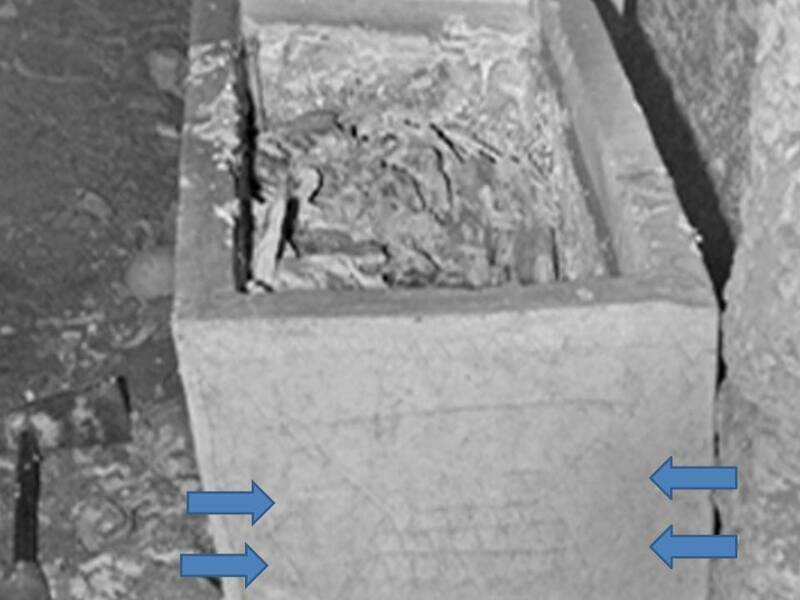 When one looks carefully at the 1981 Photo of Ossuary 4, the patterning on the facade, which is only just visible, looks identical to the patterning on the museum replica of ossuary 5 (Preliminary Report, p. 40, fig. 19). Could it be, then, that Kloner's ossuary 4 is actually Jacobovici and Tabor's ossuary 5? 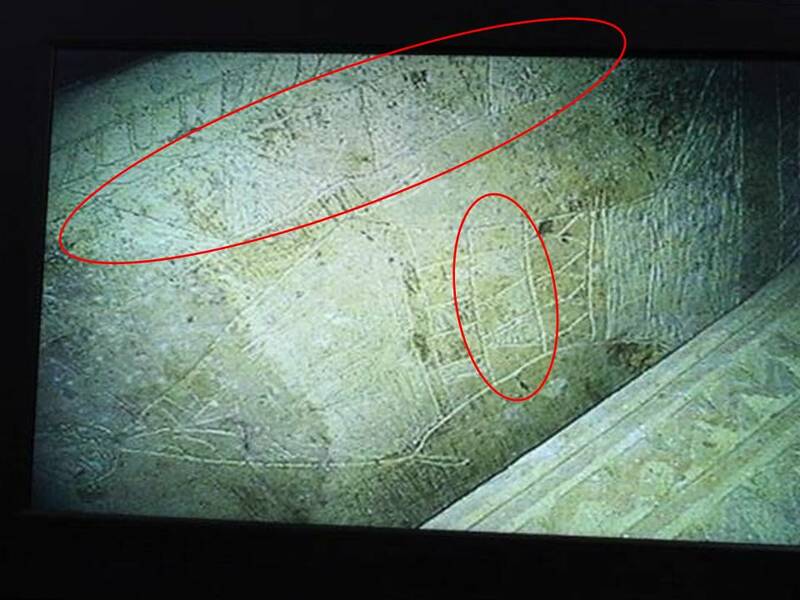 Better pictures of the corners of ossuary 5 from 2011 could help to confirm or deny this. I repeat that I am only posing the question on the basis of the scant evidence that I can see. Ossuary 2 in kokh 2 (2011; "Highly Decorated") also looks like it has similar markings to the 1981 Photo of Ossuary 4. However, the resemblance is not as close as it is to the museum replica; also ossuary 2 has a domed lid and not a flat lid. The lid on the floor in the 1981 photograph of kokh 1 looks similar to the lid that we see under (2) above, i.e. the lid that is described as belonging to ossuary 5, kokh 3. It is claimed that this ossuary was originally in kokh 2, though, and not kokh 1. It may not be the same lid. I apologize for the somewhat technical nature of this post. It emerges from my attempt to understand the findings presented, and to work out how the 1981 investigation coheres with the 2011 one. * "Although we were not allowed to move anything in the tomb, not even a hair’s breadth, one of the lids of Kloner’s ossuary 5 was ajar and we could actually peer inside with our cameras and see bones. The circled chalk mark “5” was still visible inside the bone box," Tabor, James D.; Jacobovici, Simcha, The Jesus Discovery (Kindle Locations 1006-1008). Simon & Schuster, Inc.. Kindle Edition. It is common for New Testament scholars and others to be disparaging about Simcha Jacobovici's claims first to have found the lost tomb of Jesus, and then to have located the tomb of his earliest disciples. One of their favourite means of criticizing Jacobovici's films is to refer to Dan Brown and the Da Vinci Code. The point of making this comparison is of course to imply that Jacobovici is simply creating historical fiction, sensationalist stories masquerading as responsible history. It might surprise some of Jacobovici's critics, therefore, to find out that he actually embraces the comparison with the Da Vinci Code. Indeed one might say that the book is his inspiration. When one reviews the comments he has made on these tombs, the Da Vinci Code is repeatedly mentioned, over and over again. The Da Vinci Code in a way has been very good for this investigation into the Jesus family tomb, into the lost tomb of Jesus. Why? Because it is not history but at least it has sensitized millions upon millions of people to the issues. You know, was Jesus a rabbi? Was he married? Is there any reason to believe that he wasn't married? Was Mary Magdalene downplayed after the resurrection? Did they have a kid? All these questions are out there now . . . . So in a sense the Da Vinci Code has laid the groundwork for this investigation in my film and the book . . . The Da Vinci Code is fiction, thrilling fiction. This is thrilling reality. The interest in The Da Vinci Code may explain why it is that Jacobovici finds his "Lost Tomb of Jesus" theory so compelling. He has already imagined a reality that he subsequently finds corroborated by his interpretation of a cluster of names in a first century tomb. Is this a real life Da Vinci Code? Is this really happening? Is The Da Vinci code like a bore compared to what's going on here? The danger with this kind of approach is that it conceptualizes history as a code that needs breaking, as a mystery that requires solving. There are, of course, elements in the historian's task that are like this, but most of the time history is not about "connecting the dots" (another of Jacobovici's favourite images); it is about admitting ignorance, realizing that there are many missing pieces, but trying properly to understand the pieces that we do have in their proper context. There are two Marys in Jesus' life, as everybody knows, one is his mother, you know, the Virgin Mary, and the other is, Mary Magdalene, you know, post Da Vinci Code everybody knows Mary Magdalene. (There are several more than two Marys, but that's a story for another day). It needs to be stressed whenever thinking about the claims about the Talpiot Tombs that there is simply no reliable historical evidence that Jesus was married to Mary Magdalene. It is not that he could not have been married to someone. It is that -- if he was -- we have no good historical evidence of it. The expectation that we would find Mary Magdalene in Jesus' family tomb is not an expectation born out of a study of the early texts. It is an expectation born out of too strong a devotion to the story from Da Vinci Code. For my earlier posts that played with this topic here on the NT Blog, see The Beatles and the Jesus Family Tomb and The Statistical Case for the Identity of the "Jesus Family Tomb", both from February 2007. Although my comments on the Talpiot ossuary B have focused so far on other issues, there is one thing I've been curious about in relation to the "fish" interpretation. If this is a fish, why do the designs in its body change from rectangles, to shaded and non-shaded triangles, to "Y" shapes? Is it more likely that these are several different attempts to depict fish scales, one row at a time, or is it more likely that they are simple ornamentation, as on a vessel of some sort? My curiosity is aroused by the fact that the design in the middle segment* -- shaded and unshaded triangles -- is apparently the same design as the ossuary's decorative border, also shaded and unshaded triangles. I have drawn attention to these elements in the picture above, which I have also rotated by ninety degrees so that it fits on the page better. I think it is more likely that we are seeing a decorative design on the border that correlates with the same decorative design on the object, rather than that the decorative design on the border contrasts with the scales of a "fish". * I am speaking here of the middle section in the raw footage, which features three main segments, rather than the doctored image, which features four. If there's something wrong with our facts, with our investigations, someone should just point out the mistakes and I'd be the first to correct them if somebody actually says, "Hey, you made a mistake here." But so far that hasn't happened . . . 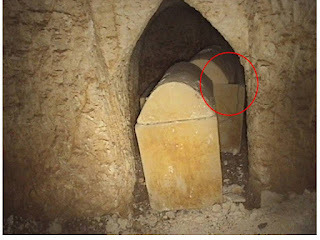 Almost five years ago, on March 11 2007, I listed multiple errors and inaccuracies on the Jesus Family Tomb website, ranging from minor mistakes to outright nonsense. I have often repeated the point in the intervening years, and others have linked to it. Every mistake that I pointed out has remained on the site from that day to this. Was there a predisposition to find Jonah and the whale? The Book of Jonah is centered around a major conflict between God and Jonah, initiated by Jonah’s resistance to obey God, who calls upon him to declare judgment in Nineveh. Jonah resists this calling and attempts to flee, only to be thrown overboard as a result of a storm inflicted by God. Jonah is then swallowed by a great fish sent by God. Jonah remains in the belly of the fish for three days and three nights, before reciting a prayer asking God for mercy. The previously relentless God answers Jonah’s prayer, and forgives him. Jonah then proceeds to fulfill the call of prophecy, and manages to turn 120, 000 people to God in Ninevah. Why is this worthy of comment? I recall being puzzled by the inclusion of this page at the time since there is no obvious relationship between Jonah and the (original) Talpiot tomb. 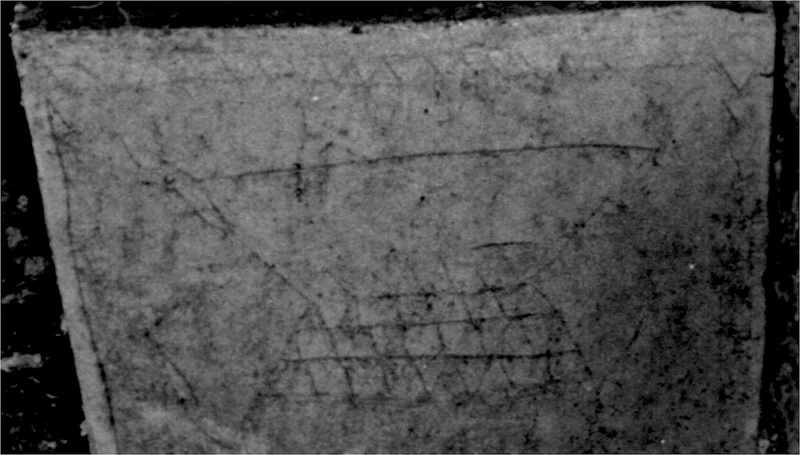 Bear in mind that this appeared in 2007, several years before the excavation of Talpiot Tomb B with its alleged imagery of Jonah and the fish. Does this demonstrate, therefore, that there was at least a predisposition to interpret a symbol found in a subsequent tomb as Jonah and the fish? The irony, which was not lost on me, was that Jesus, who spoke in parables and codes, told his disciples that the only "sign" that he would pass on to them regarding his mission on earth was "the sign of the prophet Jonah." Christian theologians have always interpreted this to mean that just as Jonah spent three days in the belly of the whale, Jesus was predicting that he would spend three days in the belly of the tomb before he was resurrected. I had studied this passage in Luke because I believe Jesus was following in the footsteps of Jonah when he sailed to the mysterious "land of the Gadarenes." It was on this fateful trip to the land of the Gadarenes that Jesus, according to the Gospels, quelled the tempest, and it was in the necropolis of Gadara that he exorcised demons from two men and transferred the demons into a herd of swine (Matthew 8.24-27; Mark 4.35-41; Luke 8.22-25). ** It was a code. Strangely enough, I had been working on that code, parallel with the search for the tomb. Now I found myself crawling in the dark over half a dozen books of Jonah, in the belly of what was arguably Jesus' death chamber. 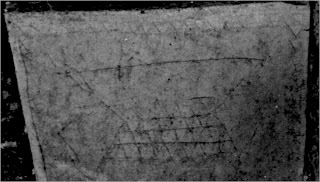 Somewhat surprisingly, Jonah and the whale is in Jacobovici's mind at the very moment that he is exploring this tomb, several years before the discovery of an alleged image of Jonah and the fish on an ossuary in the tomb next door. The fact that we might have a demonstrable predisposition for a particular interpretation does not, of course, invalidate that interpretation. And if the experts end up agreeing that the picture in Talpiot Tomb B is of Jonah and the Whale, the predisposition will simply be interesting but irrelevant. However, where there is scepticism about the interpretation of the picture as Jonah and the Whale, the natural human inclination to find what one is looking for may need to be taken into account. ** Note: The references given here at to the Stilling of the Storm pericope and not to the Gerasene Demoniac, for which see Matt. 8.28-34 // Mark 5.1-20 // Luke 8.26-39. The "two men" detail is taken from Matthew's (secondary) redaction of Mark's story. Simcha Jacobovici, who has recently been appointed professor of religious studies at Huntington University, has answered critics of The Jesus Discovery in a couple of venues, on James Tabor's blog and now in comments on the ASOR blog. Over on Exploring our Matrix, James McGrath asks Was Thaddaeus Jesus’ Original Drummer, or his Secretary of Housing and Urban Development? It's nice to know that I am not the only one to use bonkers analogies in Historical Jesus classes. The other day I was talking about the inner circle of Peter, James and John in the Synoptics (Mark 5.37, 9.2, 14.33), and comparing it with a different but overlapping inner circle of Peter, James and John in Paul (Gal. 2.9) and I found myself referring to the changing personnel of Charlie's Angels! 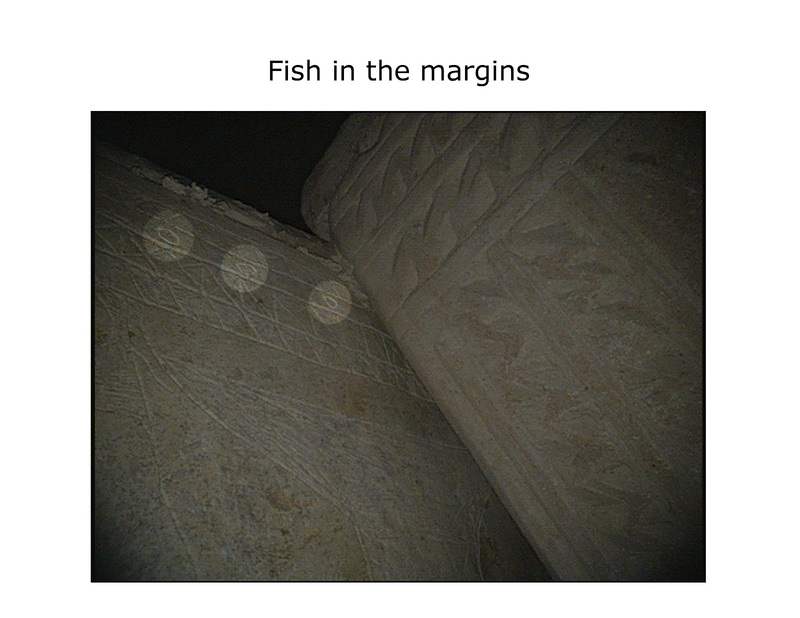 So it turns out that there is a really important Synoptic Problem angle on the issue of the Talpiot Tomb B, the "patio" tomb and its alleged depiction of Jonah and the fish. Now, I know what regular readers will be thinking. I'm going to go on about the wholehearted acceptance of the Q theory and ignorance of Q scepticism in Jacobovici and Tabor's Jesus Discovery. Well, it's true that I could go on about that if I wanted. After all, they accept the Q hypothesis without question, they do not call it a "hypothesis", they treat it as an established fact, a "discovery" on a par with the Dead Sea Scrolls and the Gospel of Thomas and so on and so on. But no, that's not my problem. That's endemic in scholarship and is especially common in books for the non-experts and I'm used to it. I expect it. However, and this is the important point, the use of resurrection imagery in connection with Jonah does not appear in Q.
Q 11.16 But‚ some .. were demanding from him a sign. 29 But .. he said‚ ..: This generation is an evil .. generation; it demands a sign, and a sign will not be given to it — except the sign of Jonah! 30 For as Jonah became to the Ninevites a sign, so also‚ will the son of humanity be to this generation. Matt. 12.40: For as Jonah was three days and three nights in the belly of a huge fish, so the Son of Man will be three days and three nights in the heart of the earth. In other words, it is Matthew's gloss written in the post-70 period and it is not evidence for what Christians in the earliest period thought. To put it another way, there is no evidence from the earliest period that imagery from Jonah was used in connection with Jesus' resurrection. I understand why Jacobovici and Tabor wish to stress that Jonah is mentioned in connection with the resurrection in the pre-70 period. They are right to note that Q, if one accepts the hypothesis, does indeed mention Jonah. However, the mention of the sign of Jonah in Q is connected specifically with the preaching to the Ninevites. Q experts like Kloppenborg link it with Q's deuteronomistic theology and with preaching of repentance and the rejection of God's prophets. Scholars often tire of studying the Synoptic Problem, but it does repay careful attention, especially in cases like this, where the devil is in the detail, and the evidence for pre-70 resurrection imagery evaporates. * Tabor, James D.; Jacobovici, Simcha (2012-02-28). The Jesus Discovery (Kindle Locations 1115-1117). Simon & Schuster, Inc.. Kindle Edition. ** Chapter 3, footnote 5.